Spring is right around the corner – the perfect time to refresh, reboot and get rid of anything that is bogging you down. How about your employee paperwork? Are all those dog-eared files and folders taking over your space … and your patience? Whether you keep paper or electronic files, best practice is to maintain three separate folders for each employee: personnel, payroll and medical. Personnel files cover everything from job applications to performance reviews, payroll files include salary-related paperwork and time sheets, and medical folders hold documents such as health insurance forms, doctors’ notes and medical leave paperwork. Store all records in clearly labeled folders – whether paper folders with quick-reference tabs or the consistent naming of electronic folders on your desktop. Although you may be tempted to throw unneeded records in the trash, don’t – especially when it comes to sensitive or confidential records. 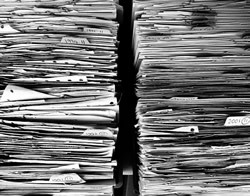 For paper files, use a shredding device or dedicated shredding service. Electronic files should be purged by destroying old hard drives or running overwriting software. You can’t necessarily take a break every time someone hands you work-related documentation or emails information to you, but you should have a plan. Consider designating a specific inbox for paperwork and/or scheduling 20 minutes at the beginning or end of each day to address recordkeeping tasks. By devoting some time upfront for these tasks, you’ll gain five minutes here, 10 minutes there, which gives you the upper hand down the road. Today, businesses of all sizes are shifting to a paperless office. Switching to online HR software for everyday employee recordkeeping can eliminate the clutter and create tremendous efficiencies. You can say goodbye to messy desks and overflowing filing cabinets because important records are centralized and just a login away. For more recordkeeping tips, watch the on-demand webinar, 5 Powerful Resolutions to Simplify Employee Recordkeeping in 2018 from ComplyRight.